Spring Break, Jesse James, Harry Truman and Snow! As a general rule–at least prior to 2006–Howard and I did not make trips over Spring Break! The event always occurred in mid-to-late March. Since I worked as an adjunct for several colleges and since spring breaks between schools seldom agreed with one another, I didn’t have a spring break! I might be free from one campus for a week–but I wasn’t free from the other. Also, March weather can really be a messy time for us here in Denver. We often have our heaviest snows in March. In March 2002 or 2003, for example, we had two weeks of spring break! A blizzard slammed us the week before the break. The break was officially scheduled the second week, so on such short notice they couldn’t tell us to return to classes. Everyone had plans. Over my years of teaching, my schedule changed between the schools. I stopped working for some and also began working in online instruction. Finally, I reached the point where I didn’t have competing schedules. By 2006, I could enjoy spring break. “Let’s take a trip!” Howard suggested in March 2006. Typical of March weather in Colorado, a rain and snow mixture arrived the morning we planned to leave. Bound and determined to go, we loaded up the car and headed east on I-70. The rain fell steadily, and the wind cut us like a knife whenever we got out of the car. We drove as far as Topeka and spent the night in a motel. The following morning, we were back on the road again. And we finally reached St. Joseph! This was not our first visit to St. Joseph. We went there with a student group in the 1960s when Howard was a student at Park College. The Mental Health Hospital in St. Joseph was looking for student volunteers, so Howard and I went there as part of a tour. (I have to say that mental health has come a long way since then!) The reason for our trip to St. Joseph in 2006 related to a city lot we had purchased as an investment in the Patee Historical District a few months before. This is the first time we would see it. 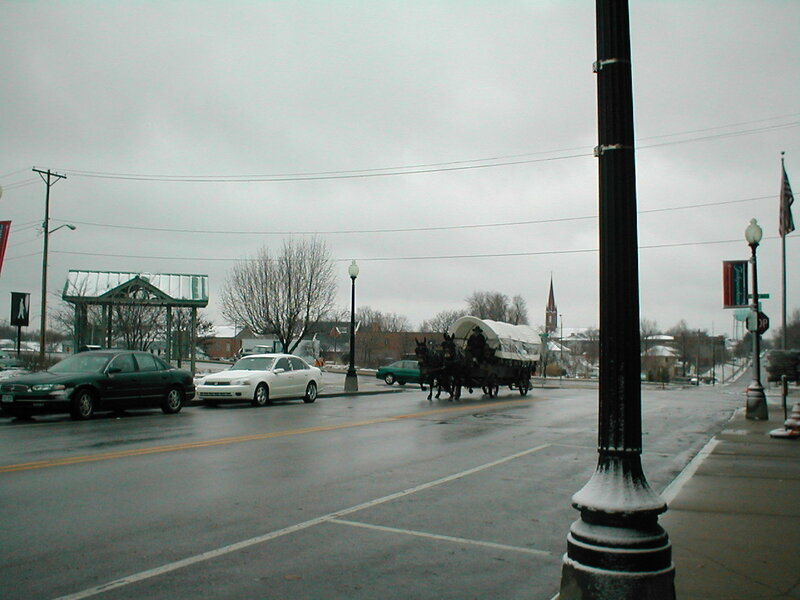 We spent most of our time in the Patee Historical District that day in March 2006. The Jesse James House Museum is one block up the street from our lot, and it was the only place that was open. The doll museum and Pony Express station wouldn’t open until May–so Jesse James became our main focus. The house was originally located on a bluff on Lafayette Street, a bluff that overlooks our lot! 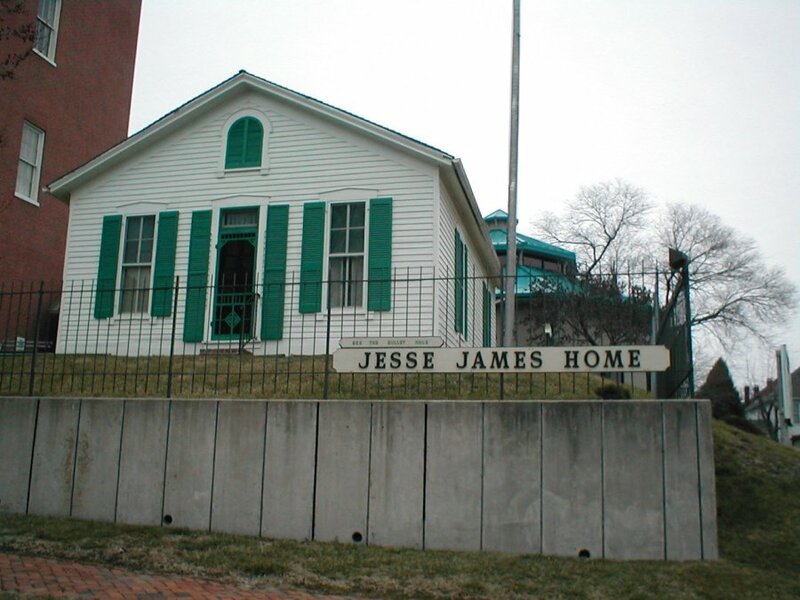 Jesse James liked the location of the house because of that bluff. He wanted to be able to see whether anyone was sneaking up on him! As Tom Howard, few people knew his real identity–but the Ford brothers knew! The house was eventually relocated from Lafayette Street to Patee, where it sits today. And the bluff behind our lot was lowered fifty feet. But we could still stand on the back of the bluff and look down on our lot. The man inside the Jesse James house was knowledgeable about the rascal. Of course, I had to ask him about the DNA test on Jesse’s body. Some years ago, the people in Missouri grew tired of hearing the Texas story about the man who claimed to be the real Jesse James. Although the man died years ago (he lived to be 102), stories still persisted that the real Jesse was buried in Texas and not in Kearney, Missouri. So Jesse’s body was exhumed. The DNA results gave him a 99.7% proof that he was indeed the real Jesse James. The man in Texas? They exhumed the wrong body (go figure!) So they have no proof! Our time spent in the Jesse James house was well worth the trip. Back then, I was compiling research for the book I would eventually write and publish in 2010: The Sum Total: A Search for Levi Clay (1843-1917) and Jesse James (1847-1882). The next morning, we discovered we had seen St. Joseph, but we weren’t ready to return to Colorado. We drove around St. Joseph for much of the day and by 4:00, wondered whether we should stay there another night or go to another location. “Let’s go to Independence!” Howard suggested. On our way over there, we stopped at the Red X in Riverside–the place where we used to shop early in Howard’s college days. We bought some pizza and chicken and drove on over to Independence, where we booked two nights in a motel. 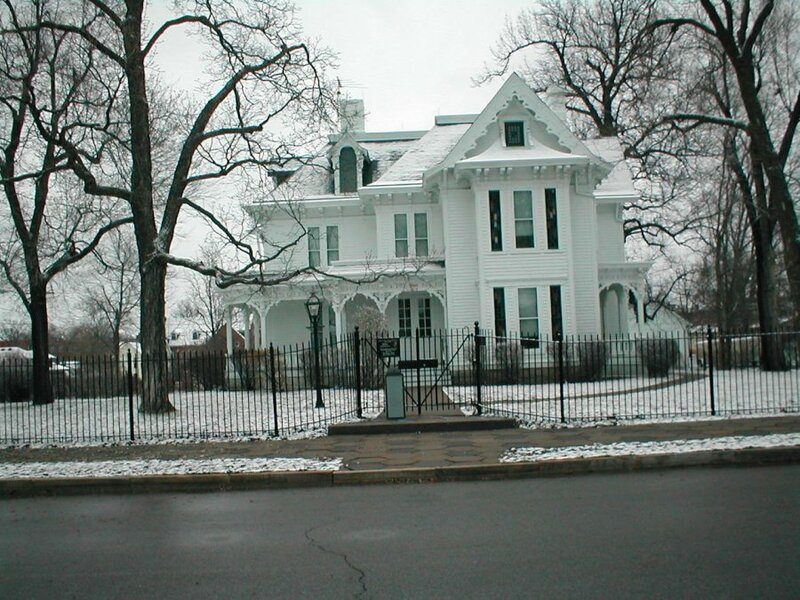 Howard lived in Independence, Missouri when Harry Truman was President. It would be fun to prowl around the square. 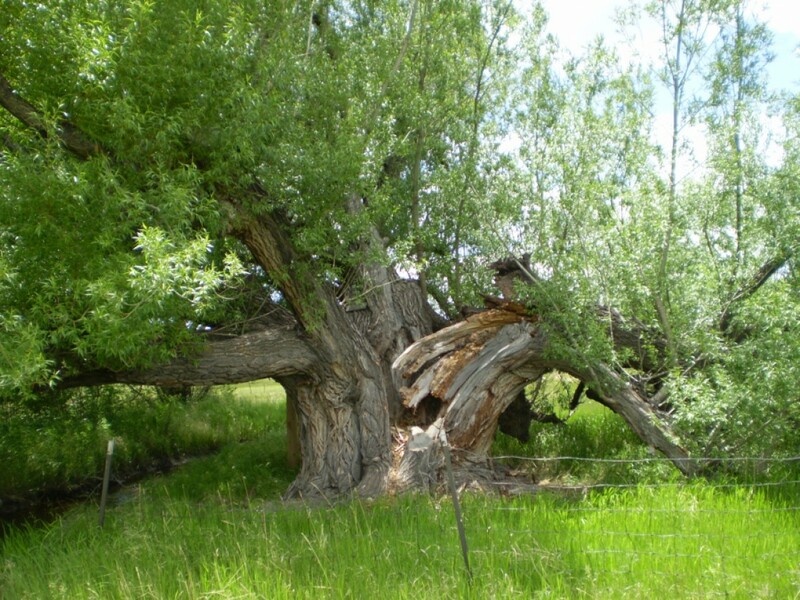 Besides, Howard wanted to find the house where his family lived–which he found! Snow greeted us the next morning–a rain and snow mixture and a cold wind. The weather didn’t stop us. We headed to the town square and found the Visitor’s Center open. While Howard conversed with the person in charge there, I went outside to take pictures on the street. And that’s when I saw a covered wagon approaching! 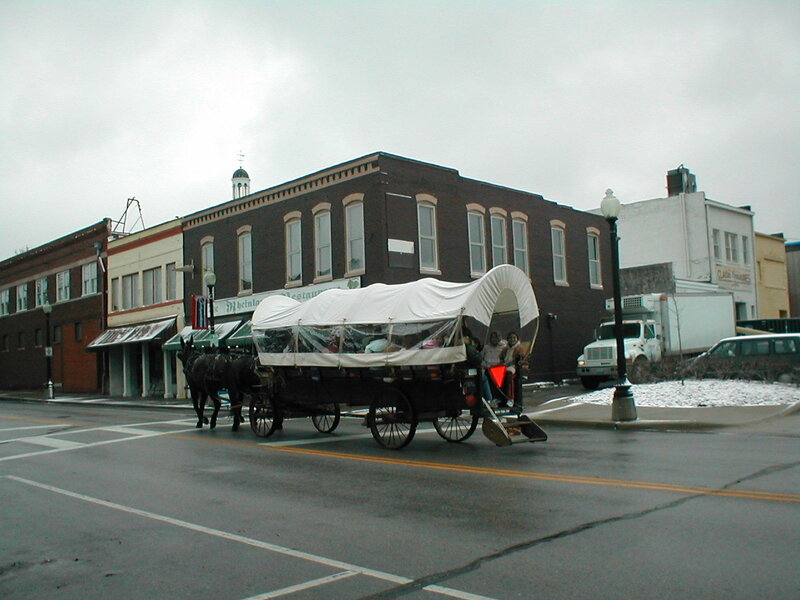 Because of the weather, the wagon was covered with plastic in order to keep the school kids dry! They were on a field trip around old Independence, and I could hear them squealing with delight as the wagon passed by. It seemed as though we encountered those school kids everywhere we went that morning. At least we had the Truman house to ourselves! When Howard and his brothers were little, they walked by the Truman House on their way to school. And they often speculated concerning whether or not armed guards were watching them through the windows with cocked weapons! Of all the lovable characters from Independence, the thirty-third President of the United States–Harry S. Truman–stands above everyone on the list! I remember a woman telling us how he would walk up to strangers on the street, shake their hands, introduce himself and stand there talking with them. “He was as common as an old shoe!” the woman stated. And that is why the town of Independence loves him. You can’t go too many places there without seeing some reference to the President! We were told that five sitting and former Presidents were entertained in that house. Now let’s see whether I can remember them: Hoover, Eisenhower, Nixon, Ford–and I can’t remember the fifth–Roosevelt (maybe)–Kennedy (perhaps.) Nixon played Truman’s piano. The parlor where these men were entertained was being remodeled when we were there, but we could stand in the doorway and peer inside. The upstairs was off limits. Margaret Truman Daniels had put it off limits because she “didn’t want people tromping through my memories.” It may have been opened since then, but I don’t know. Bright and early the next morning, we set out south on Highway 71 and drove to Fort Scott, Kansas. The old 1840s Military Fort is still in Fort Scott, something of special interest to me. Some of my ancestors living in Jasper County during the Civil War fled there to save their lives. A family member had been murdered by bushwhackers and after that, Union families fled to Kansas. 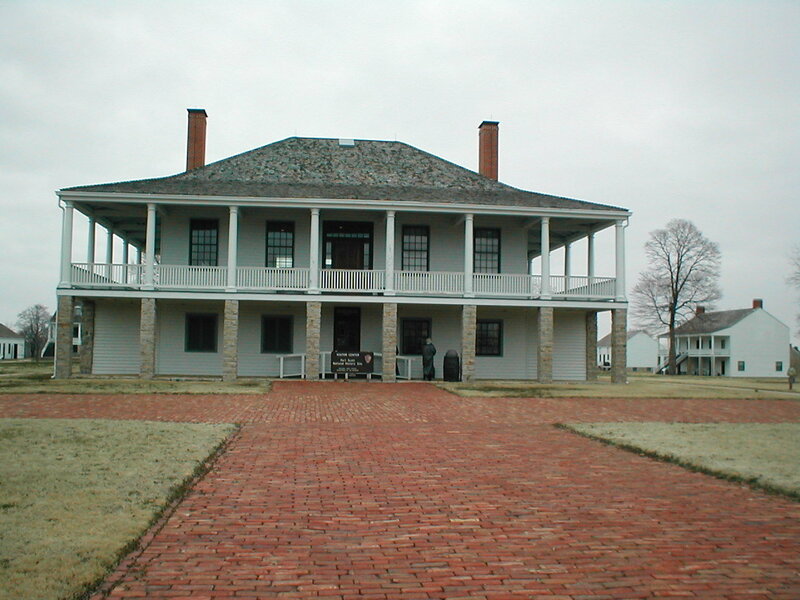 My third great grand uncle, Lazarus Spence, arrived at Fort Scott with a case of measles. So while Howard mused himself in the antique shops, I ran around the old fort grounds, taking pictures. After an hour or so, we were back in the car and on our way west to Colorado. Since that spring break in March 2006, we have taken a number of trips from 2007 through 2009. Some of them were unique, but none of them as unique as this one. It was wet and snowy! It was cold and blustery! But we loved it!